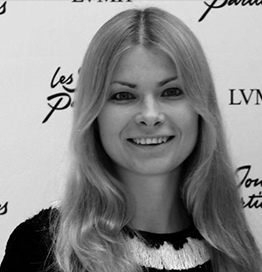 As a part of Mediaquest team, Katia is an international business development adviser for luxury and retail companies. Strongly believing that all lifestyle industries (fashion, retail, travel, hospitality, dining and entertainment) are key pillars of healthy social communities and strong economies, Katia’s life mission is to contribute to the international development of diverse industry players, from SME to global brands. Katia got her business acumen while working in Investment Banking in London and Paris, after graduating from Sciences Po Paris with a Masters of Finance in 2010. Passionate about Consumer Goods and Luxury industries, she integrated the Corporate Advisory Department of Nasdaq, where she helped to define Investor Relations strategies for large listed multinationals of Consumer Discretionary Sector. After receiving an MBA degree from INSEAD in 2016, Katia moved to Dubai, where she was responsible for merchandising and business development projects at Louis Vuitton Middle East. She set up the INSEAD RCLG Alumni UAE Club. Katia is also INSEAD’s case study writer on the topics of technological innovation and digital disruption in luxury and fashion.